Diverticulosis & Diverticulitis – What is the difference and why should I care? Diverticular disease was almost unknown in 1900. By 1970 diverticular disease was the most common disease of the colon in western countries. Almost 60% of Americans over the age of 60 have diverticular disease. 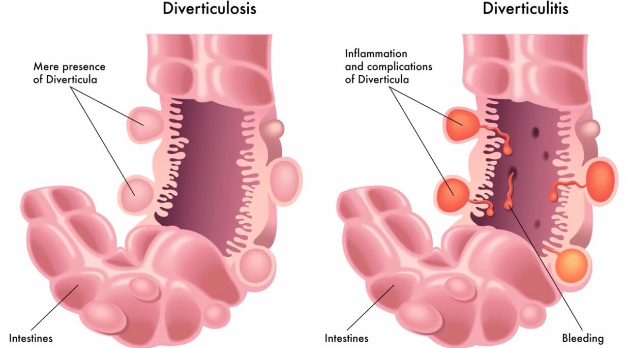 Diverticulosis are pouch-like structures that can form through points of weakness in the muscular wall of the colon. Diverticulitis occurs when these pouches get inflamed or infected. This can cause pain, most often in the left lower abdomen, fever, or a change in bowel habits. Most people with diverticulosis have no symptoms and will remain symptom free for the rest of their lives, i.e. never have an episode of diverticulitis. Individuals with diverticulosis do NOT need to avoid nuts, seeds, and popcorn. In fact, some studies suggest that these foods may reduce the risk for a diverticulitis flare. A high fiber diet can help prevent diverticulosis and diverticulitis flares. Regular exercise can help prevent diverticulitis flares. If you have been diagnosed with diverticular disease and would like to better understand how to care for yourself and prevent complications of your disease, come visit our well trained staff! Our team includes a Gastroenterologist, Nurse Practitioner, Dietitian, Fitness Consultant and Behavior Counselor that will help you develop a plan to get healthy and stay healthy. Liz is a nurse practitioner who loves empowering her patients with the knowledge they need to succeed in managing their conditions and improving well-being. Incorporating conventional and integrative approaches backed by science are at the forefront of the care she provides. The gut microbiome, irritable bowel syndrome, impaired sleep and weight management are all topics she enjoys learning about.